In seven sessions the Liberticide reading circle series formulates a critique of post-modern neo-liberal thinking, in order to be able to arrive at a self-critique of Western thought, and thus, in the tradition of Marxism and the Enlightenment, to give shape to a new perspective on society. These sessions will be presented in the form of seminars in which there will be opportunities for questions and remarks during the classes, before a closing general discussion. All Liberticide programs begin at 8:00 p.m., with the exception of Wednesday, 4 May, when the program begins at 8:30 p.m. Conducted in Dutch. ‘Context’, led by Tiers Bakker and Robin Brouwer. In this first meeting there will be a discussion of how post-modern society arose. ‘Economics’, with guest speaker Pieter Lemmens. Subjects which will be dealt with in this session will include the structural problem of underfinancing, instant capital and the myth of the market as the condition for freedom. Wednesday, 4 May. NB: Starting at 8:30 p.m.
‘Security, surveillance and control’, leg by Robin Brouwer. On the basis of recent analyses and empirical research, it will become clear that security and control have become a selffulfilling prophecy which is no longer driven by governments and administrators, but is in the hands of a diffuse network of market participants. ‘Politics’, with guest speaker Frans Winkens. In the session about politics and democracy, from the work by Schmitt, Rancière and Badiou, among others, it will become clear that the neo-liberal condition is undermining the democratic foundation of our society. ‘Media’, led by Tiers Bakker. In this gathering about media, it will be shown that with the introduction of neo-liberalism the objectivity people expect from the media is on the wane. Discussion: ‘Fiscalicide. Marx, Sloterdijk, of: heeft het kapitalisme toekomst?’ with Liesbeth Noordegraaf-Eelens Ewald Engelen and Theo W.A. de Wit. Moderated by Laurens ten Kate. A discussion based on Peter Sloterdijk's much-talked about interventions under the title Die nehmende Hand, die gebende Seite in the Frankfurter Allgemeine in 2009 (Suhrkamp, 2010). Is there any sort of pressure that can be put on the harrowing gap between the ultra-rich and the rest of society, between those whose wealth is counted in billions and those who must count every cent? According to Sloterdijk the fiscal systems of the Western welfare states are the culprit. So long as there is no serious alternative for the regime of the free market, should we not train, yes, compel, multimillionaires to give rather than carry off? ‘Alternative society’, led by Tiers Bakker and Robin Brouwer. How to change the system? 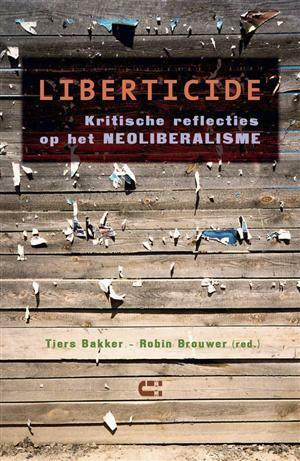 Four lecturers will present their views on possible alternatives for our neoliberal society: Marc De Kesel (philosopher, Leuven), Femke Kaulingfreks (philosopher, Utrecht), Tiers Bakker and Robin Brouwer (Liberticide). Recommended literature: Bakker, Tiers. Brouwer, Robin. Liberticide. Kritische reflecties op het neoliberalisme. Utrecht: IJzer, 2008.